For other information please contact Scott Truex, Director. The Gunnison-Crested Butte Regional Airport (GUC) is located in the city of Gunnison, just 28 miles from the Town of Crested Butte and 31 miles from the Town of Mount Crested Butte. Our year-round airline partner is United Airlines with flights from Denver. During the winter months, you can also fly on American Airlines non-stop from Dallas/Ft.Worth and on United Airlines non-stop from Houston. If you need to contact the airport, please call 970.641.2304. Please check United.com or AA.com as schedule deviations may occur. Times are subject to change without notice. All flights and times are subject to change without notice. Please visit www.united.com for the most up to date flight information. All flights and times are subject to change without notice. Please visit www.aa.com for the most up to date flight information. View and print a downloadable version of the Winter flight schedule here. Hertz, Avis, and Budget car rentals are available at the airport. We recommend making advance arrangements to rent a car prior to arrival. Transportation is also offered by Alpine Express; reservations are required. You can also book a private shuttle with Crested Butte Speciality Services. The communities of Crested Butte and Mt. Crested Butte offer a FREE shuttle bus that runs regularly between the two towns. 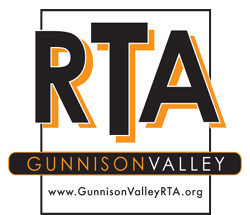 And our FREE Valley wide bus system offers transportation between Gunnison and Crested Butte/Mt. Crested Butte (map). The bus does NOT service the airport. All scheduled times are subject to change without notice. Please, visit FlyGUC.com for up-to-date flight information. Great travel deals for the Gunnison Valley, including air, can be found in our Value Vacations section. New Locals fare on American Airlines valid for travel Dec 13, 2012-April 1, 2013! Valid only for travel originating in Gunnison and roundtrip travel. All prices are inclusive of taxes and fees. Gunnison to Dallas RT- $299.60, Gunnison to Los Angeles RT- $318.20, Gunnison to Chicago RT- $395.20, Gunnison to LaGuardia- $412.20 and Gunnison to Miami RT- $406.20! Some blackout dates apply, and always based on availability. Must purchase at least 14 days prior to travel. Visit www.skicb.com/localfare for more details. For quotes and reservations, call Crested Butte Vacations at 970.349.2287 for a quote today, or just stop by the Emmons Building in the CBMR Base Area. Taxes & Restrictions: Prices are each way based on round-trip Economy class purchase, and are in U.S. dollars. Seats are limited and sample prices may not be available on all flights. Prices and schedules are subject to change without notice. Prices include (a) a federal excise tax of $3.80 per U.S. domestic flight segment, defined as one takeoff and landing, of a customer's itinerary; (b) up to $18 per round trip in local airport charges; and (c) September 11th Security Fee of $2.50 per enplanement originating at a U.S. airport. For international destinations, government taxes and fees of up to $240 varying by destination are included. Reservations are required. Tickets must be purchased 14 days in advance. Prices are valid for travel: Fly from Gunnison to Dallas between December 13 and 22, 2012 and fly from Dallas to Gunnison between December 30, 2012 and January 7, 2013. All travel must be complete by January 7, 2013. Changes to your ticket may be made if you meet the restrictions of the new fare and pay up to a $150 fee plus any fare difference. There is a $10 ticketing fee when booking through Crested Butte Vacations. STATEMENT OF RIGHTS In accordance with the provisions of the Americans with Disabilities Act and Civil Rights Act of 1964, The RTA does not discriminate on the basis of disability, race, color, national origin, sexual orientation, or gender. For more information about these statutes, or to file a complaint, contact the RTA designated Disability Rights and Title VI coordinator, Scott Truex, Executive Director, PO Box 39, Crested Butte, CO. 81224. (970) 275-0111. For Telecommunication Relay Service, call 1-800-659-2656 (hearing impaired). Individuals will be permitted to uses service animals, as defined within ADA guidelines, if necessary.